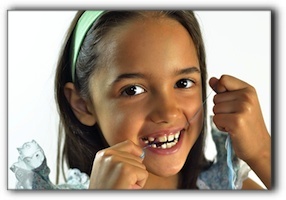 Most Fargo men and women know that flossing is an important part of dental health. The value of this simple exercise has been shown time and time again. But does fear have to play a role in anyone’s commitment to flossing? Flossing offers a chance to remove the food particles your toothbrush may miss. But, being afraid of the cavity bugs may not compel Fargo folks to floss regularly. The fear of gum disease or cavities may work for a week or so after a cleaning. But it probably won’t be enough to instill a lasting habit. At Designer Smiles in Fargo, we encourage our dental patients to look at flossing as an opportunity to start fresh – just as showering starts you off fresh each day. Flossing is a positive opportunity to remind yourself to smile and feel happy as you approach your day. It could be a time to think about the foods you are putting into your mouth, and consider what improvements could be made to your diet. It doesn’t have to be about fear! At Designer Smiles, we offer many ways to enhance your smile and maintain your dental health. Make an appointment today. Our services include porcelain veneers and teeth whitening. We also provide sedation dentistry.